Since its formation over 30 years ago the core philosophy of Micron Sprayers has been to produce appropriate and affordable spraying equipment for the small farmer in the developing world. 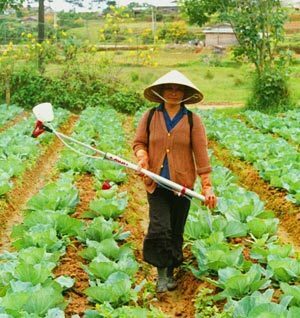 The manually operated knapsack sprayer is the standard method of pesticide application used throughout the developing world. It is a classic example of technology of the developed world merely being scaled down for use in developing countries, without thought being given for the specific needs and priorities of the user. Knapsack sprayers require large quantities of water, which must be located and transported, frequently in situations where water is scarce. They are arduous to carry and operate in often extreme conditions and are not only inefficient in terms of energy expended on the part of the operator but also in terms of chemical utilisation. This is because much of the spray produced is in droplets of a size inappropriate to the target (either too large or too small) and thus wasted, contributing to environmental contamination rather than crop protection. Micron's founder, the innovative thinker and inventor Edward Bals, looked at the problem from the point of view of the farmer in the developing world. He developed the idea of Controlled Droplet Application (CDA) using spinning disc sprayers for low volume spray application and this is the principle upon which Micron's core products are still based. By feeding the spray liquid onto a spinning disc, centrifugal force breaks the liquid into droplets which are more even-sized than those from a knapsack sprayer in which the spray is forced through a hydraulic nozzle under pressure. Droplet size can be selected according to the optimum size range for the particular insect, disease or weed target by adjusting the speed of rotation of the disc. The more even spray coverage resulting allows spray volumes to be reduced to between one and ten percent of those needed with a knapsack sprayer with equal or better chemical efficacy. Not only does this mean that large volumes of water do not have to be carried but strenuous pumping is avoided, as the smaller volumes involved mean that gravity alone is sufficient to feed spray liquid onto the disc. In addition, when smaller spray droplets are used, the wind can be used for spray dispersal within the crop and up to five rows can be treated at once, making such a system vastly more productive than a knapsack sprayer which can treat only one row at a time. This also means the spray is carried away from the operator AND the operator, holding the sprayer downwind, walks through untreated foliage - both of which minimise the risk of operator exposure. The technique of incremental spraying used for CDA fungicide and insecticide application means that operator contamination is minimised during treatment, with the wind carrying the chemical away from the worker who always walks in unsprayed crop. Additionally, as the amount of chemical handling and the time spent spraying is reduced, the period during which operators are exposed to pesticides is minimised. Typically a hand held spinning disc sprayer such as the Micron Ulva + can treat a hectare in just one hour using 1-10 litres of spray. This compares with up to ten hours needed to cover the same area with a knapsack sprayer using 100 to 200 litres. The decreased physical effort and increased productivity afforded by CDA has important implications for the small-scale farmer in the developing world. In some instances it means that crop protection is possible where it would not be feasible using knapsacks for treatment due to the time and work involved or a shortage of water. It also, very importantly, makes crop protection technology more accessible to women who play an important role in developing agriculture, particularly in the area of food production. Where farmers already use knapsack sprayers, CDA affords the opportunity to spray more efficiently and safely. The ability to respond swiftly to pest attacks means that routine preventative treatments become unnecessary and it is possible to spray only when pest numbers approach damaging levels, safe in the knowledge that they can be controlled in time before economic damage occurs to crops. This makes CDA fully compatible with pest management systems such as Integrated Pest Management which advocate chemical treatment only when other control mechanisms fail to keep pest numbers in check. Over 30 years of experience working closely with farmers, researchers and agriculturalists in the developing world means that the needs and problems of the end user are kept mind when designing and developing sprayers. All Micron sprayers are designed to be robust and easy to use and maintain, while at the same time being affordable to the farmer. 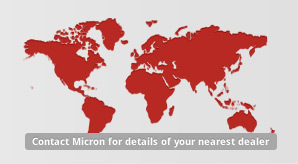 High priority is given to training and Micron staff visit user countries on a regular basis to carry out training and assess the field performance of sprayers. This provides valuable feedback for further equipment development. The new generation of Micron sprayers have made CDA technology even more appropriate for the third world farmer. The Ulva + and Herbi 4 sprayers are designed to be able to use water soluble chemical formulations which are already widely available, as well as formulations specifically manufactured for CDA or ULV application. Improved sprayer design has meant that battery consumption has been reduced and a single set of standard size, locally obtainable torch batteries typically last a farmer, who has to treat two or three hectares, for an entire season. The hydraulic pressure nozzle used with knapsack sprayers produces a wide range of droplet sizes, including both very large and very small droplets. The former tend to bounce or shatter on contact with crop foliage and end up on the ground, contributing to soil and water contamination, while the latter are prone to uncontrollable drift and are liable to settle outside the target area. Because CDA controls the droplet size range produced, CDA significantly reduces the number of these over large or over small droplets hence environmental contamination is minimised. During the 1970's cotton production in sub-Saharan francophone Africa was revolutionised by the introduction of Micron's Ulva sprayers which allowed farmers to effectively protect their crops for the first time - something that had previously not been feasible with conventional high volume spray techniques due to the time and labour involved. In 1975 only 50% of cotton grown was protected (3% by spinning disc sprayers). By 1984, less than a decade later, 80% of smallholder cotton was protected, with 97% sprayed with spinning disc sprayers. There was a corresponding increase in average yield of 65%. 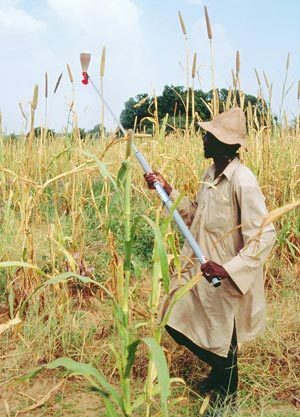 In Ethiopia and Mali aid projects have provided Micron sprayers to subsistence farmers to help them protect food crops and so increase food security. In the locust plague outbreaks of the 1980's and 1990's ULVA sprayers have been supplied via aid programmes to farmer brigades to enable them to protect their crops. In recognition of its achievements in the design of spinning disc sprayers Micron has been awarded the UK Queen's Award to Industry for technological innovation. Not only were the ULVA and HERBI sprayers revolutionary in principle and design but they have proved themselves to be appropriate and safe technology for use in underdeveloped agriculture. Micron was also presented with the first Centre for World Development Education award for long term commitment to sustainable development, with the judges stating that the sprayers have, "enabled small farmers to compete on more equal terms with larger ones by making modern technology available in a form which is accessible to them".